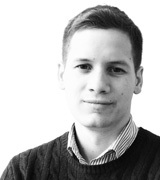 March 20, 2014, 11:43 a.m.
Britain may well take pride in keeping a stiff upper lip, but according to a new survey by YouGov there are a few things that can still make most of us tremble. The survey presented respondents with 13 common phobias and asked them just how fear-inducing each one is. 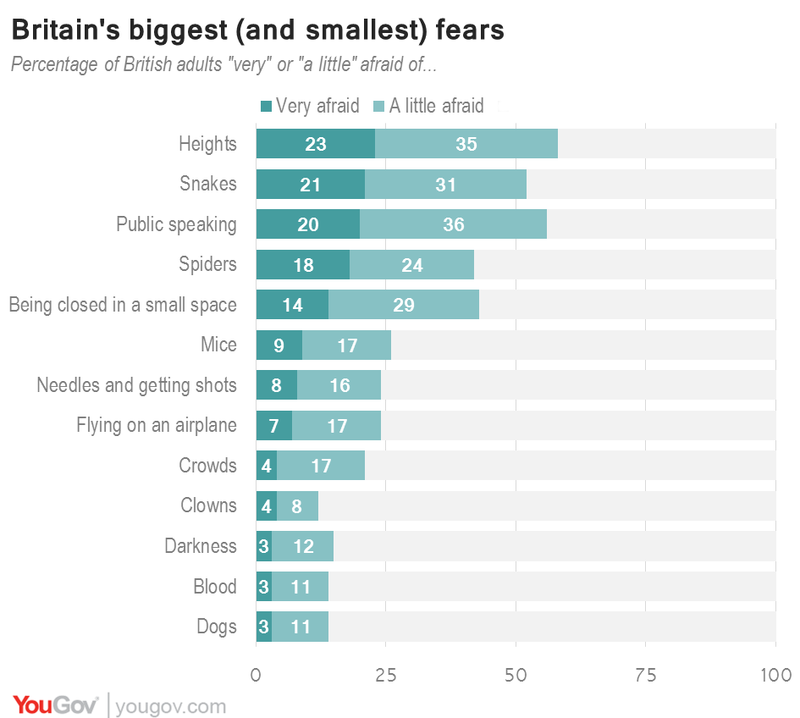 Three fears stood out for making the majority of British adults at least “a little” afraid – namely heights, snakes and public speaking. A fear of heights, also known as acrophobia or vertigo, to some degree afflicts nearly 58%, including nearly a quarter of the public who are “very afraid” of being in high places. Darkness, blood, dogs and clowns are come last on the list of fears. All are not created equal when it comes to fears. With the exception of needles and getting shots and blood – of which British men and women are about equally afraid – more women than men are afraid of each thing. The gender gap is widest when it comes to spiders, which scare only a third (33%) of men and about half (52%) of women. However, this is not the only sense in which spiders are a polarising terror. 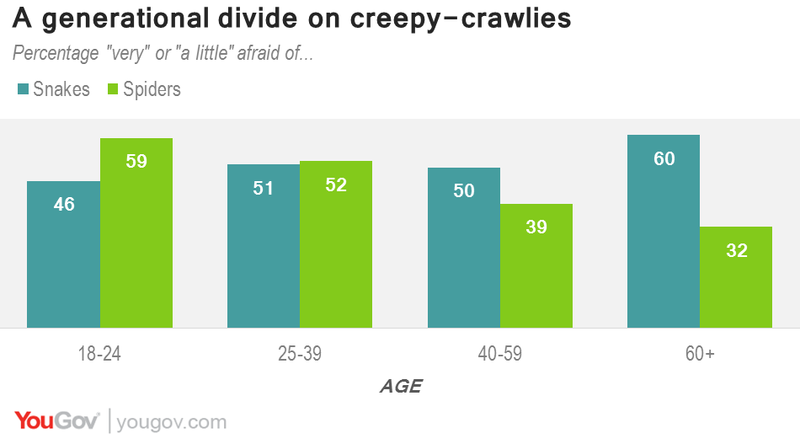 There is an even larger gap between those in the youngest and oldest age groups, with 18-24 year olds nearly twice as likely to be afraid of spiders (as 59% are) as over-60s (32%). Young people are also more likely to be afraid of public speaking. Conversely, those in the older age groups were more likely than their younger counterparts to be afraid of heights and snakes.